Standing in the Engine 33 firehouse in the Back Bay today, Boston Fire Captain Neal Mullane’s head and face were scorched and burned, scars from the frantic effort he and other firefighters launched Wednesday to rescue their colleagues trapped by flames in the basement of 298 Beacon St.
Mullane, who is assigned to Ladder 18 in South Boston, was designated as the commander of the rapid intervention team Wednesday, a platoon of firefighters positioned at every fire to lead efforts to extricate firefighters if they get in trouble. 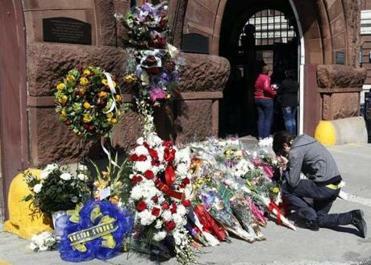 While driving across Boston, Mullane said he listened to the radio communication between firefighters who had reached the burning building before he did, especially the transmissions from the firefighters using the call sign of Engine 33 who had declared “Mayday,’’ signaling they were in distress. The call came from Lieutenant Edward J. Walsh Jr., 43, and Firefighter Michael R. Kennedy, 33, who were trapped in the basement by the raging fire. When his team arrived, Mullane said, a chief ordered them to descend several stairs to reach the front of the basement where radio transmissions from Engine 33 had said they had gone for safety. “We grabbed a hose line, we charged it [and] we made a push as hard we could to get to that stairwell and get down those stairs,’’ Mullane said. “We were trying to get down the stairs. We just couldn’t. Then there was a backdraft,” he said, using a firefighting term for what is essentially a smoke explosion. As he spoke, Mullane’s physical injuries were obvious, and unmistakable. His right ear was purplish from a burn and his right eyebrow was half burned off. The hair on the right side of his head was burned off, and there was a burn on the right side of the back of his head. But, Mullane said, the wind-stoked fire was too strong for him, his colleagues, or any other fire department, to get into the basement. The crestfallen Mullane added some final thoughts.